We’re having fun over at Splitcoast this week! It’s the annual week long Dare to Get Dirty Challenge hosted by current and previous Dirty Girls. If you’re not a Fan Club Member…why not? This is for Fan Club Members only and it’s a blast with lots of great challenges and prizes! The card base is a 5″ x 5″ square in Basic Black, followed by a layer of old, old Provo Craft designer paper. Next comes a rectangle of River Rock that’s been embossed, stamped and paper pierced. It’s been layered over another rectangle of Basic Black. I’ve used two strips of Cajun Craze that have been stamped and layered over Basic Black next. 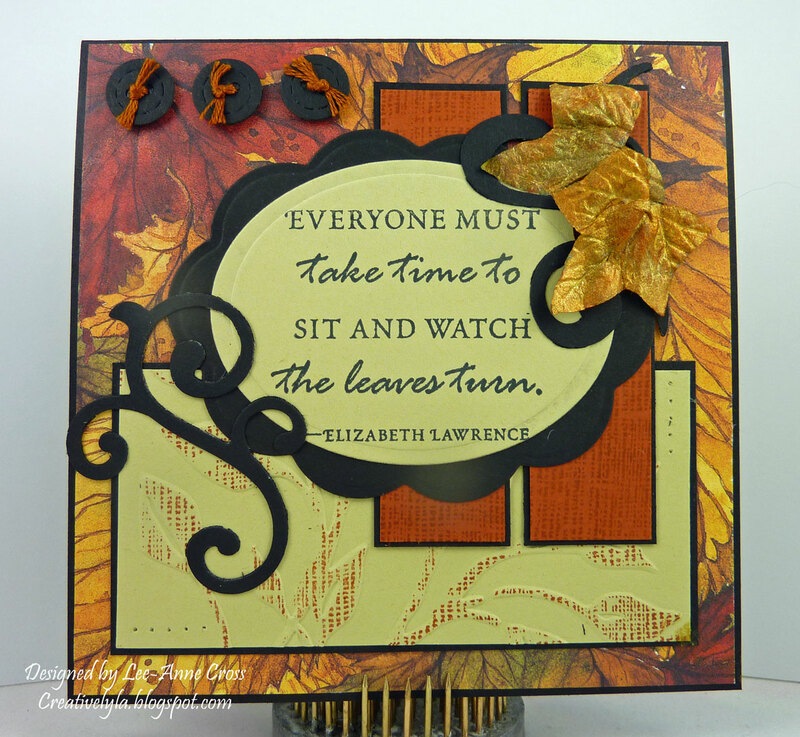 For the sentiment I’ve used two die cuts that are layered. The sentiment has been stamped in black. Over top of the sentiment I’ve used two more die cut flourishes. The leaves have been painted with three different colors of H20’s to add some shimmer and have been attached with dimensionals. My three little black buttons are actually die cuts that have been threaded with a rust colored embroidery floss and popped up on dimensionals, too. This card qualifies me for six (yup count ’em!!!) Dirty Girl Challenges. Whew….that’s a whole lotta challenges rolled into one card! Well, there you have it! Have a fabulous Friday, everyone!